Clickfunnels is a building platform where you can create landing pages, opt in pages, billing pages and manage a variety of other sales funnels. It provides a great opportunity for people in the ecommerce industry -not only to market their product well, but also to increase their conversion rates. You can build sophisticated marketing funnels for generating leads, selling a product or creating a membership site. You can even create ‘custom sales funnels’ to boost the marketing of the products, that’s already on your website. Moreover, whether you want a hosting platform for your existing website or need resources to guide you to design a website, clickfunnels has everything. It however, is not suitable for selling multiple products – the way an ecommerce site is expected. A marketing funnel typically consists of an opt in page (for capturing the visitors’ email address), an e-mail autoresponder (for welcoming and thanking the visitors or sharing more information with them) as well as the sales page. 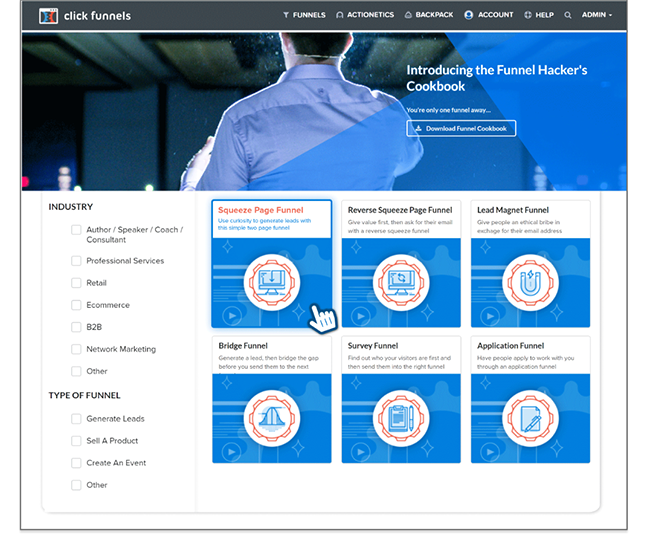 Clickfunnels has a user-friendly drag and drop interface and offers several built-in templates that can be used to create multiple web pages for various funnel types. These templates are ‘mobile responsive’ which means they automatically get adapted to various devices and screen resolutions. The funnel pages usually have the same theme to maintain the consistency in appearance and each page can easily be customized to suit your business requirement. You can add or modify the text, images, videos, taglines or any other content that can enhance the overall look of your marketing page – for driving the sales. It even allows you to build a template from scratch incase you don’t like the existing ones. The ‘Actionetics’ tool enables the businesses to get an insight into their subscribers’ activities throughout the sales funnel – which can help in improving client engagement, while the email builder can be used for effective communications and building relationships with them. The Backpack tool allows you to manage your affiliates for product promotions, their commissions and payments, and the affiliate page settings. Clickfunnels also allows for integrations with various payment processing services, email autoresponders and several other third party applications like CRM, ERP etc. And with an inbuilt shopping cart, you can track the orders of your customers as well. Clickfunnels offers two monthly subscription plans : Basic ($97) and Advanced ($297). The Basic Plan includes 100 pages, 20 funnels, 3 domains and up to 20,000 visitors a month. The Advanced plan or the Etison Suite is more apt for bigger businesses and includes unlimited visitors, funnels, pages, domains, email list tools as well as Backpack and Actionetics apps and priority support. Both the plans have a 14- day trial period. Shopify is a popular ecommerce platform that is primarily used to create an ecommerce store and sell physical or digital products, ranging in all possible categories. It offers a variety of tools and resources that can help you set up and run your business in no time, even if you don’t have any coding knowledge. With an easy interface and a huge collection of both free and paid themes for designing professional looking websites, Shopify is also loaded with free and paid apps in their app store – that can significantly expand an existing store’s functionalities. Shopify allows you to sell unlimited products and provides you with an unlimited storage and bandwidth. You can sell across a variety of sales channels, like online marketplace or social media sites, and keep a track of all the transactions from the admin page itself. It even allows you to manually enter the order details for an offline order. The Shopify POS app (for Android and iOS respectively) enables you to process orders and take payments in person. Several type of discount codes (such as monetary, percentage, or shipping discounts) can also be created within this software. 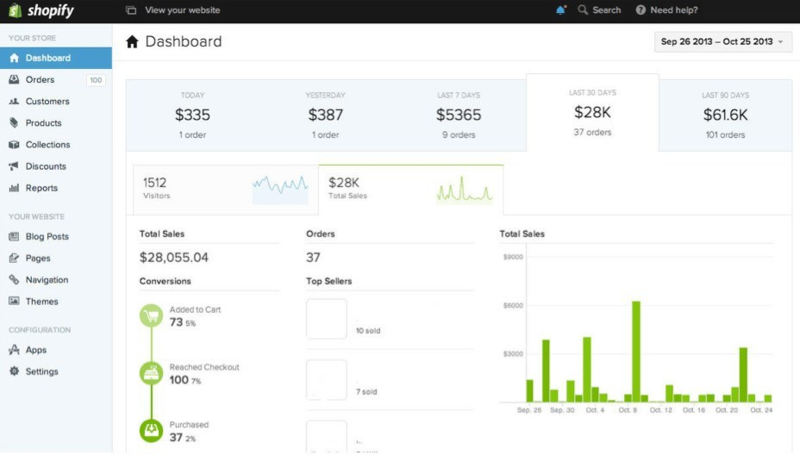 The user dashboard highlights the key analytics such as sales, orders, visitors data, and you can even view all your money related information as well. With Shopify Payments, you can easily manage your payment gateway and it also includes the fraud analysis feature that saves you from any potential fraudulent orders or losses. Depending on the type of business you are running, Shopify offers three monthly pricing plans – Basic Shopify ($29), Shopify ($79) and Advanced Shopify ($299). All three plans have unlimited products and file storage, website and blog, multiple sales channel, round the clock support as well as a 14-day free trial period. The higher two plans also include fraud analysis, gift cards, reports and advanced cart recovery. So Which One Is Better- Clickfunnels Or Shopify? The intention of both Clickfunnels and Shopify is to drive sales and increase conversions. 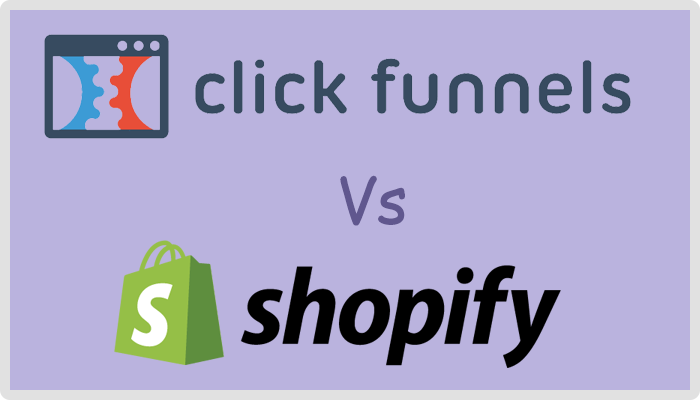 However if we have to compare the two, then Shopify seems to be more of a front-end platform that is targeting cold traffic and repeat buyers, while Clickfunnels is more of a backend tool that focuses on collecting emails, launching new products or promotions. The whole idea of Clickfunnels is to analyze the visitors first, build a healthy rapport through emails, gain trust and then target them with specific deals. This way the customers become more responsive towards your offers. But which one is better is hard to say, as both the softwares have different purposes. However, the fact that healthy sales funnel is the key to success – is pretty valid for all those businesses who completely rely on their visitors to turn into potential customers. So the obvious way would be to combine the two – to build a long term brand. As a beginner, it would be best if you started out easy with Shopify, gain momentum for your online store and then incorporate Clickfunnels. It can ease out the efforts of ‘warming up your customers to your offers’ which can help you improve your sales, rather than randomly throwing offers at them.